One of the problems with PC-based Internet telephony is the need for a headset, which many people find clumsy and cumbersome. Of course, you can get away with using your desktop speakers and a separate microphone if you want to deal with poor sound quality and plenty of echo. 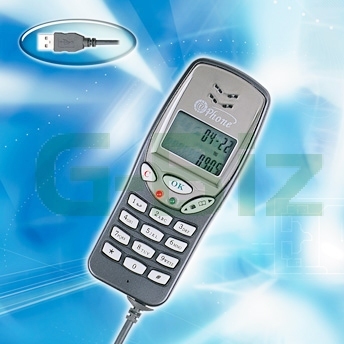 We have come up with an alternative using the ubiquitous USB port to create USB-based multimedia VoIP handset phone. Simply connecting it to an available USB port of your PC, you will be able to start using it in no time. Its full duplex audio and echo cancellation have made it the ideal VoIP device for you. By using powerful Digital Signal Processor, the USB phone is able to deliver an echo free, full duplex audio through the Internet. The power of the USB phone is provided by the USB port of your PC, therefore, you do not need to have an additional power adapter for your USB VoIP devices. The drivers of the USB VoIP Series are provided by Microsoft Windows, thus no additional drivers are required. Drivers are currently available in Microsoft Windows 98/98SE/ME, and Windows 2000. With its compact size and USB interface, the USB phone is your ultimate travel companion. You can take it with you wherever you go. Just plug in any computer with an available USB port and an Internet connection, along with voice chat or ITSP (Internet Telephony Service Provider, such as Net2Phone, Dialpad, Mediaring and PC-Telephone.) applications on it, and you are ready to make long distance calls to any phone in the world or global call to any PC. 32 Jaffa Drive, Brampton, Ontario, L6S 4C5, Canada.